well after rain out after rain out, I finally got out on a double points double length race. Came in a respectable 18th out of 28. I say respectable because it was the cars first time going and my first time in a front wheel drive subaru. There are issues with the rear suspension(see the suspension forum!) and some other things that arose. I managed to get a hotdog wrapper stuck over the open tube I cut the snorkus from. A few other things that I can improve on too. Two saturdays from now and then every saturday night through mid september plus a couple wednesdays mixed in. The car is fast(in relation to the others) and will be a top five car come the end I am sure. And I swear on my kids not yet born lives I will get a photo up. Wow, circle track racing a Subaru sounds pretty cool. Can you use Legacy turbo supension on your car w/o breaking the rules for your class? "suspension must stay OEM for the make and model". So as long as its from a Legacy I guess I can use it. And I am. They let us use strut bars. We get tech'd before the first race and then any time we come in the top 3. I havent done real well so far, so I just keep cheating it up more every week! The only thing they are real jerks about is height. Stock sway bars are 19mm front/15mm back. I put an 18mm Outback bar in the back which helped the cars rear tendency to flex(and spin out) but now the car is real tail happy because of that(still spins out-hahaha!) I put a 20mm front sway bar out of a 97LSi but that didnt help too much more with front grip. So, hopefully 2moro my Tribeca bar comes in (25mm) and it will fix that. Thats a big jump, so it may cause even less desirable results in a different area, but thats ok. Live and learn. I have 3 new oem springs(left rear is a reused spring on purpose) and new Gr2 struts/hats. I wish there was a spring out there that would drop me just a little bit, like an inch or so. AM endlinks as well. Jamal has been a big help with suggestions in the suspension forum. I think these cars just naturally have more than average chassis flex, but that may just be me. Alot of the GC STi springs give slight lowering with much increased damping but they are a bit costly. Rs springs drop the leg turbo about an inch & can be had CHEAP, according to the suspension chart F&R are 157/149 LBS/IN vs. 132/132 lbs/in for Leg Turbo springs. I got a suby I run as well, car is into it's third year. 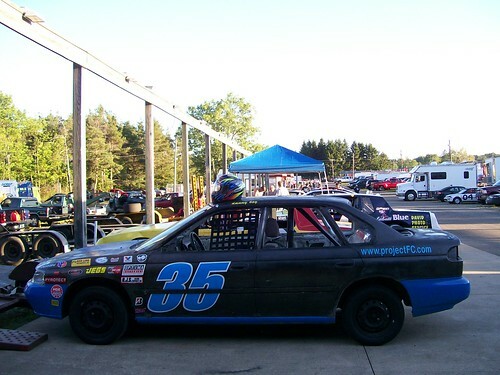 In fact it is the only car at my track that has ran for three years in a row. Only problems i have with it is that the weight of the car will eat up the right front tire real quick. Better late than never. Season championships up next weekend. This car cooks now. Will make a good run next year for sure now that I've figured it out. Got a few more upgrades for next year and its good to go. Thanks for a ton of help from numerous people on this board. I built this car 75% from this board. what all have you done to it? What size tires you run? I'm trying to come up with new ideas for my car, I think i hit the limit on what i can do to make it faster. I found this on youtube. I do not know who made this, but my legacy is in this mess somewhere. 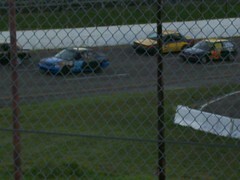 I was in 4th for the first half of the race got pushed all the way back to 13th(out of 30) with like 4 laps to go. It was the cars 3rd time out this summer. Regardless this should give anyone an idea of the mayhem that goes on. I made it through 7 races with just a few scraps. I am a black and blue blur somewhere in there.